I don’t know what exactly it was that lead me to make the decision, but I do know that it was quick. For years now, I have read about all the advantages that can come from a ketogenic diet. Not a permanent, life-long keto diet, but a short-term period where you substantially reduce the amount of carbs that you feed your body. This is done in efforts to allow healing in ways that it doesn’t do as rapidly with sugar and carbohydrates. My decision to experience keto was not based on weight loss… it wasn’t even based on any health reasons! The incentive was purely to experience it first-hand to see if it could be used as an effective therapy with my obese client populations. Not gonna lie…eating juicy 80/20 beef and buffalo chicken dip all the time was not disappointing!!! I enjoyed everything I ate and looked forward to my meals every day. So what I believe I got out of this experience the most was from a psychological standpoint – that there is no superiority in 93/7 beef compared to 80/20 beef, only fewer calories and less fat! There is NOTHING wrong with healthy fats!! Fat is so unbelievably stigmatized in our culture. We think that the fat in our food is easily converted into the fat in our bodies, when in many cases the opposite may be true! Those that I work with on a 1-on-1 basis know what I mean…Fat is a slow form of energy which means it takes more time to be broken down and turned into energy. When we move slowly (which unless you’re training for a huge race is most of the day, every day) it makes SENSE to eat more fat because that is what we are primarily burning when we are slow! I was very strategic with my diet. Many people on keto just eat bacon, butter and cream, but I knew that if my gut and I were going to get through this together, I was going to need to fill my day with high fiber foods cooked in high quality oils – such as avocado and coconut. By the way, I’m a huge fan of Chosen Foods© Avo oil! If you are curious, you can find HERE! Sauteed spinach, broccoli, asparagus and avocado were my best friends for the last few weeks. I topped them with sour cream and sharp cheddar cheese…and it was everything delicious is supposed to be. Exercise, even slow aerobic exercise like weightlifting was hard at first, but eventually I overcame it. I even tried to fast in the mornings so that my body could experience the cleansing effects of gut regeneration during exercise without all of that food in the way…Maybe this is one of the moves I made that was wrong. As an active individual that was fasting for 16 hours I was freaking hungry! My metabolism was way too fast to handle the shock of larger meals, so I unnoticeably experienced a rise in my cortisol levels. Now, let’s get one thing strait guys – I love me some cortisol in my life! This stress hormone can be a great thing at times because it prepares our bodies to physically withstand the tasks at hand…and I’m an adrenaline junkie! So when this hormone is active at the right times in our lives, cortisol is a good thing! This means hormonal balance! So now let’s talk about what happens when cortisol is present in our bloodstream during the times where we don’t need it to physically stimulate our bodies…Like around bed time, or when we’re sitting around at home watching TV. Chronic stimulation of stress hormones means chronic stress in our bodies. And while we all experience stress in our day-to-day lives, what we eat can actually influence our bodies on a second-to-second basis every day!!! So forgive me, because this is an overly-simplified explanation of a biochemical pathway, but what this shows is that our bodies convert cholesterol (a productive type of fat!) into hormones that our bodies use to prepare us for life. 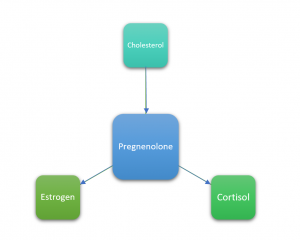 Now here is where things get interesting because when cholesterol is converted into pregnenolone, it is converted into estrogen or cortisol, or both! But when the body’s demand for cortisol goes up (ie, during times of high stress) estrogen production can be compromised!! Now, I don’t like to think of myself as an overly emotional person. Really! But what drawbacks that the keto diet did instill in me revolved around this pathway. I have never experienced such rapid mood swings during times where minor thoughts that were slightly stressful tipped me over the edge. I would be sitting in my car thinking about life and felt sudden urges to cry…actually sob. At first I attributed it to the holiday season chaos, but then I started to connect the dots to my diet. Of course it was my hormones going crazy with all of the extra cholesterol in my diet and hormonal changes, but I hoped it would eventually normalize. Week 3 into keto. I had finally gotten back into training, but had been working with a recent hip injury. Oh, by the way, that meant more stress for my body. I worked out that day, then went into work where I went up to my boss to ask a question about a future project. This is when he had informed me of 4 or 5 more opportunities that we needed to act on, and I walked away nearly in tears. More work? More opportunities? I was overwhelmed and had to leave to recollect myself. I was fine in minutes but then not minutes later. And this is when I realized that there was something wrong inside of me. I love being handed new endeavours at my job! As soon as I hear about it, I’m on it! But today it was the final drop in the cortisol bucket, and I overflowed. I sat down at my desk in my office, opened the filing cabinet, and pulled out the caramel toffee blondie I had been saving for weeks. As I sank my teeth into the most emotionally satisfying dessert of the season, my keto experiment came to an end. Now let me be clear, just because my active crazy life didn’t work with keto DOESN’T mean that another lifestyle wouldn’t work with it either! I just simply believe that it is important to understand the factors that are associated with both compatability and uncompatability to any particular nutrition plan. I am forever grateful of all of the many things I have learned from this experience and can’t wait to help show the right people how to help make this a success in their lives! Dip on!! !